A water feature is among the most eye-catching improvements one can make to their lawn. It can be one or more items ranging from streams, ponds, waterfalls, fountains, cascades to pools. These garden improvements have been in existence since time immemorial. In the olden days, they could be powered by gravity, a concept that has changed as today small water pumps can be practical. Before you make a water feature, there are several factors that you need to take into account so you can make informed decisions prior to beginning work. 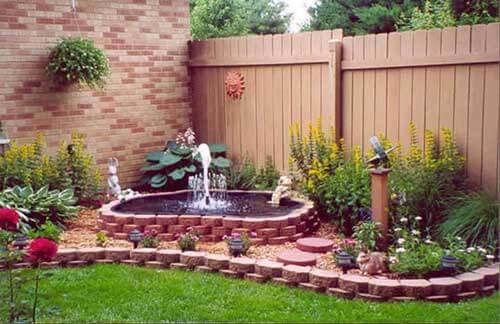 For instance, you need to decide on the type of water feature you wish to have, select the size and location. You can also decide whether to have moving or still water and whether or not to complete it with fish and plants. By deciding on all of these details prior to commencing the project, you will realize that your construction process is able to run smoothly once you start. It will also help make future maintenance easy. Determine the site where to build your water feature. Once you have done that, dig out a hole depending on the size of the water reservoir you have. Use sand to level the base and then place in the reservoir while ensuring that the base lies one inch above the ground level. You can adjust the base level using sand and a spirit level. Place the urn in the reservoir while making sure the cord from the water pump is fed through the hole on the underside .Ensure the base is sitting flat. Attach the plastic tubes to the pump outlet. Make sure the pump outlet is in upright position. Small water pumps are readily available in hardware stores and can be acquired at a reasonable price. Now connect the pumps to the power supply. N/B: The source of power should be situated in a weatherproof environment. You could cover the edges of the pond with titles or pebbles to conceal the cord and also to spruce up the area remember your objective is to beautify your yard. Fill both the plastic tub and the urn with water to the level you desire but make sure the pump is completely immersed. Turn on power, water will start to flow gently down the urn. You can increase or decrease the velocity by adjusting the pump dial. Always check the water level in your water feature. If it drops low add water as required to make sure the pump is completely immersed in. This will avoid pump burnout. Also, change water and clean feature regularly to prevent water contamination. If you don’t intend to use the feature for an extended duration of time, turn off the power and ensure the pump remains inside the water. https://www.bldcpump.com/wp-content/uploads/2015/05/Outdoor-Fountains1.jpg 324 500 jarred https://www.bldcpump.com/wp-content/uploads/2018/12/Logo-246x156.png jarred2014-09-24 14:30:452016-02-18 16:03:29How to Make a Simple Water Feature?